I believe these are the same results I got when I took a Myers-Briggs Type Indicator test in the mid-80’s. INTJ here, too. We’re a fun breed, eh? On my walk home today, I noticed this license plate. Can anyone think of a meaning for ENFJ other than a “teacher” personality profile? 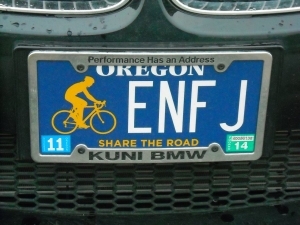 Other than having an Oregon license plate, it looks like I share only “N” with the owner of this plate.